"Jalapenos are stuffed with Cheddar cheese and cream cheese, with bread crumbs for a crunch. Baked to keep them healthier than the fried ones!" Preheat oven to 400 degrees F (200 degrees C). Spray a baking sheet with cooking spray. 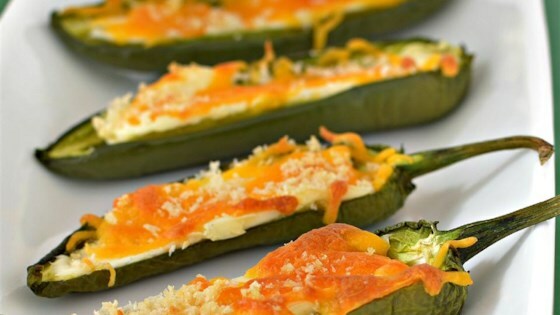 Fill each jalapeno pepper half with cream cheese, Cheddar cheese, and bread crumbs, respectively, and arrange peppers on the prepared baking sheet. Bake in the preheated oven until jalapenos are tender and cheese melts, about 20 minutes. I made this simple and tasty recipe to use up some leftover jalapenos and Monterey Jack cheese I had on hand. I would have preferred it made with the cheddar cheese, but it was still very good. I've never met a jalapeno popper I didn't like - enough said. I added crumbled bacon, fresh garlic and a pinch of seasoning salt.